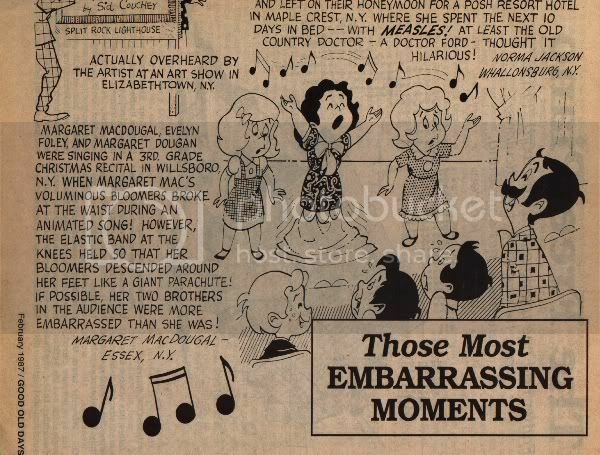 This page concerns the original (new) cartooning which appeared in the pages of "Good Old Days" magazine. As mentioned previously, Sid Couchey's art appeared in "Good Old Days" during the 1980s. I don't know when he started drawing for the mag. Sometimes he drew the cover, as shown in the two examples below. The first one below is the March 1985 issue. This cover was shown in B&W in Comic Book Artist #19 (June 2002) on page 71, accompanying the Sid Couchey interview in that issue. The Sid Couchey-drawn cover below was for the "Good Old Days Special Issues" Winter 1985 issue. This is a quarterly series that's published in addition to the regular monthly "Good Old Days" series. Old-time radio horror programs were (and still are) of great interest to me, so obviously I liked the theme of this cover. By the late 1980s, the cartoons of artists like Couchey and Kauf became less frequent in the magazine. 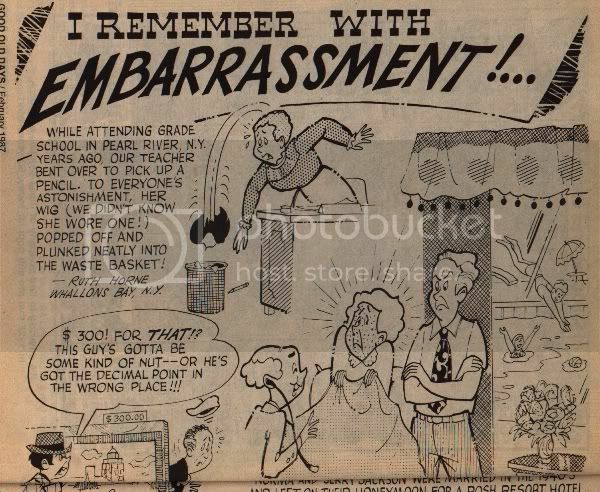 This also coincided with a format change in the magazine which included dropping most of the old comic-strip reprints (including dropping the mention of "cartoons" on the cover of each issue) and changing the cover logo for the first time. Needless to say, these unfortunate changes made for a less interesting magazine. The following center-spread drawn by Couchey appeared in the Feb. 1987 issue, shortly before the format changes took place. It's too bad that "Good Old Days" didn't use their artists to draw such comic-strip-like pages more often. 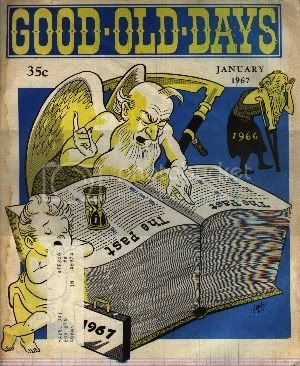 My oldest issue of "Good Old Days" (other than the 1984 Christmas Annual that started my interest in the mag) is the January 1967 issue, which I bought for a buck or two at a re-sale type place during the mid-1990s. The cover, which is reproduced below, is drawn by the cartoonist who signed his name as "Kauf." The publisher info on the first page notes that the publisher of "Good Old Days" is Tower Press, Inc. This is the same company that was publishing "T.H.U.N.D.E.R. Agents" comicbooks during this time. The staff cartoonist is listed as Jay Campbell. The publisher of "Good Old Days" was listed as "The House of White Birches, Inc./Tower Press" during the 1980s. By 1987, Tower Press was no longer mentioned in the indicia. 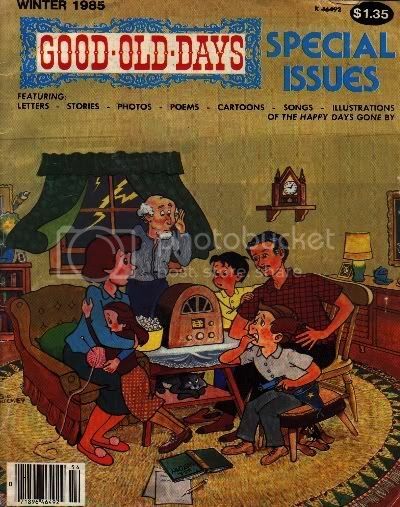 As far as I know, The House of White Birches is still publishing "Good Old Days" every month. In the late 1980s, cartoonist Don Sherwood was listed as one of the magazine's "Contributing Editors." My only previous experience with Sherwood's work was when he'd drawn Archie's "Katy Keene" during its brief (but fascinating) serious "soap opera" format in 1985. Here's a Sherwood-drawn cartoon from the December 1990 issue of "Good Old Days." 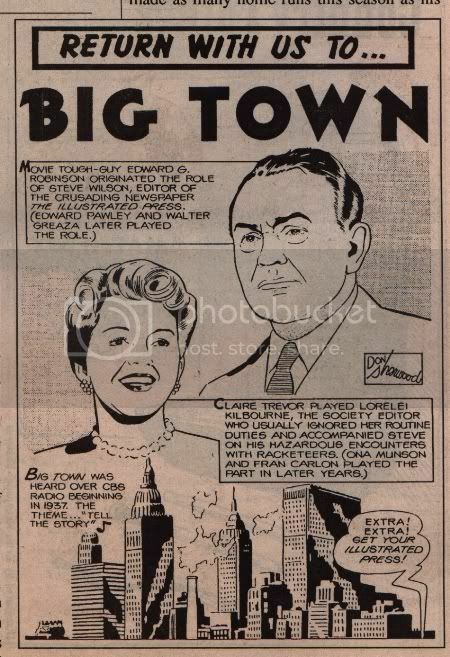 The panel is about the old-time radio series "Big Town." I presume that this was part of a series of panels about old-time radio shows for the magazine, although this is the only one I've seen (shown below). That 1990 issue was the last issue of "Good Old Days" that I bought until 1997. I bought two issues in 1997, and haven't bought an issue since. I'm happy to occasionally see the magazine still on the stands, although I think that it's a shadow of its former self due to the lack of comic-strip reprints and so on. 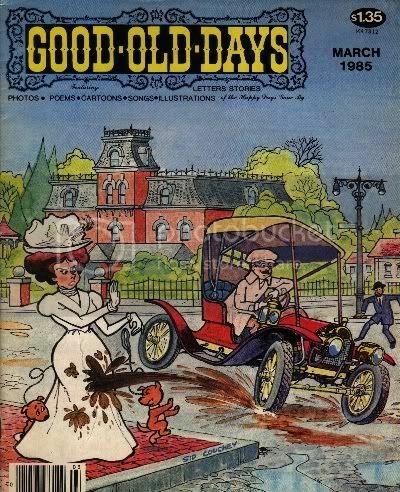 And so, ironically, I'm now nostalgic for the "good old days" of "Good Old Days" magazine!